Russian President Vladimir Putin has appointed Dmitry Rogozin as General Director of the Roscosmos State Corporation for Space Activities, effective May 24. An executive order that changes the leadership of Russia’s space agency was signed on Thursday during a meeting at the Konstantin Palace in St. Petersburg. "The President of Russian Federation invited Dmitry Rogozin to head the State Space Corporation Roscosmos," Roscosmos informs on its website. The decision was expected by Russian media outlets as rumors about the appointment has been recently circulating since the beginning of last week. 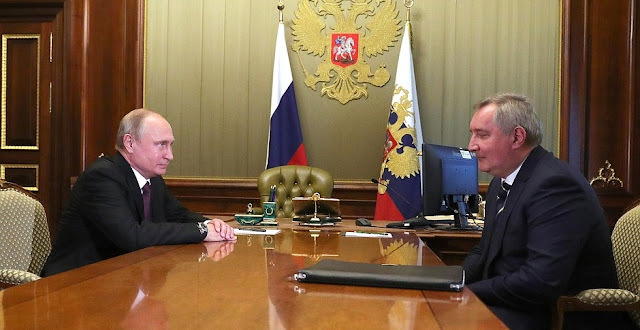 Putin met with Rogozin at the Konstantin Palace to nominate him as head of Roscosmos taking into account his experience as an expert overseeing Russia’s space activities. The Russian President underlined Rogozin’s commitment to the development of the country’s space industry. “You have already reported your proposals on strengthening and developing this company. We have discussed it many times. You have a remarkable opportunity to start implementing the development plans you proposed as the head of Roscosmos,” Putin said. In reply to Putin’s nomination, Rogozin said that he will do everything possible and necessary to meet the president’s expectations. He added that his new job entails a huge responsibility. Dmitry Rogozin previously served as the Deputy Prime Minister of Russia for Defense and Space Industry - between December 23, 2011 and May 18, 2018, when he was dismissed by Putin. It was his initiative to reorganize Roscosmos into a state corporation in 2015. Rogozin replaces Igor Komarov who served as the Roscosmos boss for the last three years and four months. According to RT, Komarov could now get a high post in Rostec, a state-run weapons producer. The replacement marks the fourth change in leadership of Roscosmos within the last decade. This is mainly due to many launch failures and corruption scandals that batter the Russian space program in recent years. Apple is getting ready for the launch of iOS 12 beta for developers. If you are interested in downloading/installing iOS 12 beta on iPhone or iPad device. It is now time to prepare for the rollout of iOS 12 update for your devices.